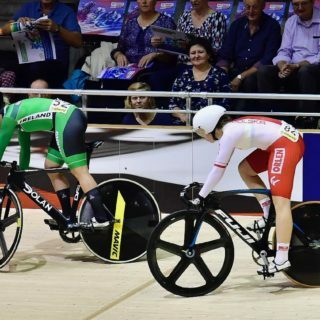 20th January 2018 Robyn Stewart raced strongly today at the final round of the Tissot UCI Track Cycling World Cup season (which runs from the 19th – 21st January) in Minsk, Belarus. Stewart was 14th in the Sprint with a time of 11.336, qualifying to the 1/8 finals. Robyn scored her best World Cup result to date, progressing out of the qualifying rounds with a time of 11.336. In the 1/16 rounds the Scotland based rider beat Russia’s Natalia Antonova moving into the 1/8 final. Former multi-World Champion Simona Krupeckaite from Lithuania powered ahead in this round, knocking out Stewart before winning silver in the gold medal final. Stewart will be in action again tomorrow – “I’m looking forward to my debut in my first World Cup Keirin tomorrow also.” This World Cup serves as valuable training for Commonwealth Games in April; having confirmed her place on the team earlier this month.